What mom doesn't love handmade cards? Using a few me & my BIG ideas products, mambi Design Team member Megan McKenna created this simple but creative card that we're sure her mom is going to adore! 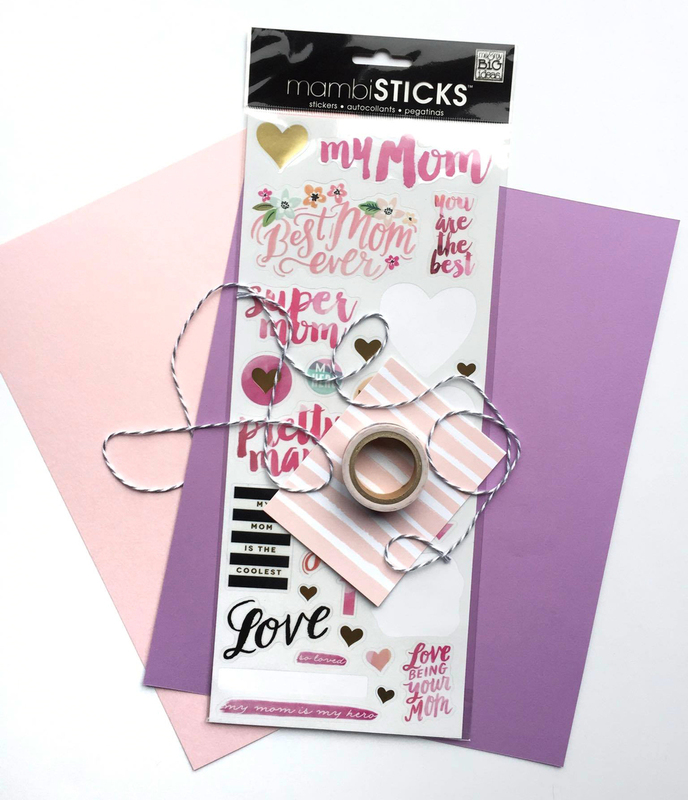 "The 'Super Mom' mambiSTICKS™ sheet is so cute and fun! I love that it has the same floral print from the 'Fresh Floral' The Happy Planner™ that I CANNOT WAIT to use in July! I chose a pocket card from the 'Botanical Garden' POCKET PAGES™ cards pack that matched well with the sticker I wanted to use. After making my purple card base, I lined the bottom and top of the card with (of course) that adorable floral washi from the 'Fresh Floral' washi tape tube. Then I wrapped gray bakers twine around the front to give it some detail. I taped a piece of craft foam behind the pocket card to add dimension. ...aaand that's it! This card took me maybe 10 minutes to make, so you have no excuse to not make your mom a handmade card!" HAPPY MOTHER'S DAY WEEKEND, everyone! Oh, the magic of washi tape! Is there anything it can't do? Today we're sharing how mambi Design Team member Megan McKenna ingeniously used some Happy Planner™ washi tape to decorate the 'egg' on this 'Happy Easter' card. "Annnd the card maker is at it again! 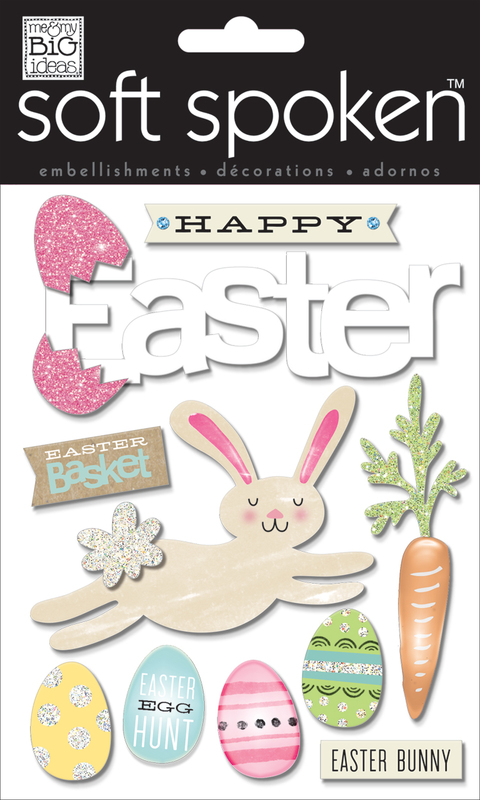 Here is a very simple and easy Easter card you can create using stickers and washi tape! With a wide variety of colors and patterns in The Happy Planner™ washi, you can use whichever color scheme you want! I wanted to go with a pastel look that would kind of match the Easter-themed SOFT SPOKEN™ stickers that I used for the front. It has light blue gems and a pink cracked egg, so I started with that!" "I wanted to use white cardstock so it looked clean and simple, and the colors from the washi tape would POP! I cut down a piece to 5 x 7" for the card form. Then I cut down another piece to 4.5 x 6.5" so there would be a border around this piece. I found a picture online of an egg form that I then traced lightly over my smaller piece. I used an craft knife to carefully cut the opening. Then I started applying the washi tape. I used the traced guideline to know where I needed to place the tape. When I was all finished I decided I wanted the smaller piece to pop off the page- so I added foam adhesive and stuck it on top of the card form. WAH LA! Your done. This took me maybe 10 minutes to do. If your wanting to send a bulk amount of cards out this season, this would be a good one to do since it is very easy and fast to make!" Card | Happy St. Patrick's Day! Top o' the mornin' to ya! We're hoping to put a little pep in your leprechaun step with this sweet St. Patrick's Day card created by mambi Design Team member Megan McKenna using our festive SOFT SPOKEN™ dimensional stickers. "All you Irish girls out there, this card is for YOU! I wish I could send all of you one of these. I am a big card maker! I love to make holiday greeting cards and me & my BIG ideas has the perfect stickers for them! I mainly only use the SOFT SPOKEN™ stickers on cards because they are a little thicker and they have foam adhesive on the back making them look like there popping off the page. I used a pack of St. Patrick's Day SOFT SPOKEN™ embellishments for the main focus of the card. The green sheet is from a new watercolor paper pack that is now available at Michael's and I thought adding in that green in the back would pull all the colors together. Now excuse me while I address this thing and get it sent out to that special someone..."
Cards | Ho!Ho!Ho! Have a Holly Jolly Christmas! 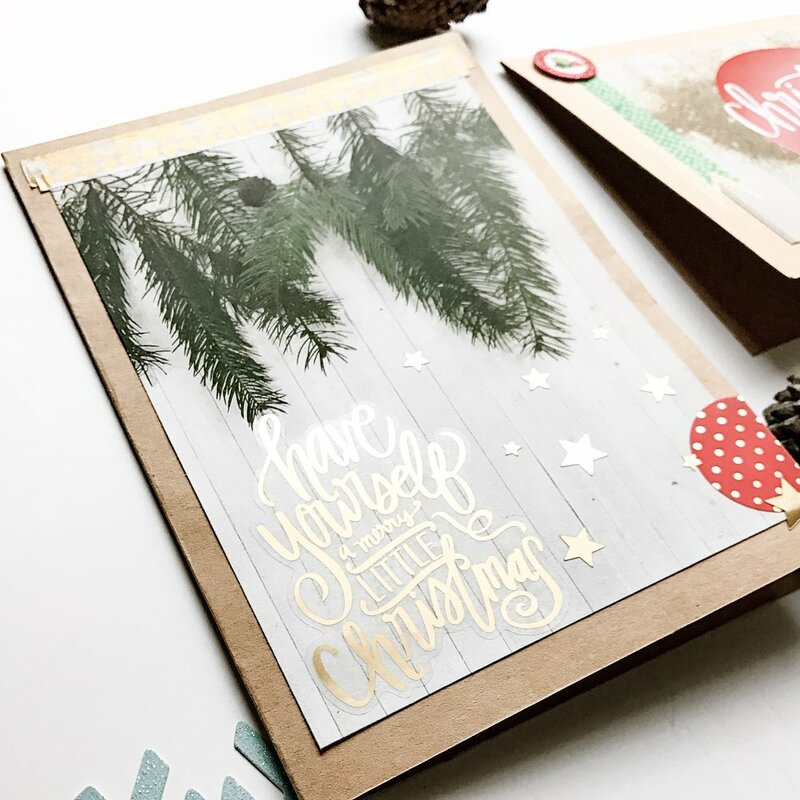 We made it, everyone... Christmas Eve is here, and today we're sharing the two sweetest holiday cards made by mambi Design Team member Jennie McGarvey that are making us feel all warm and fuzzy. 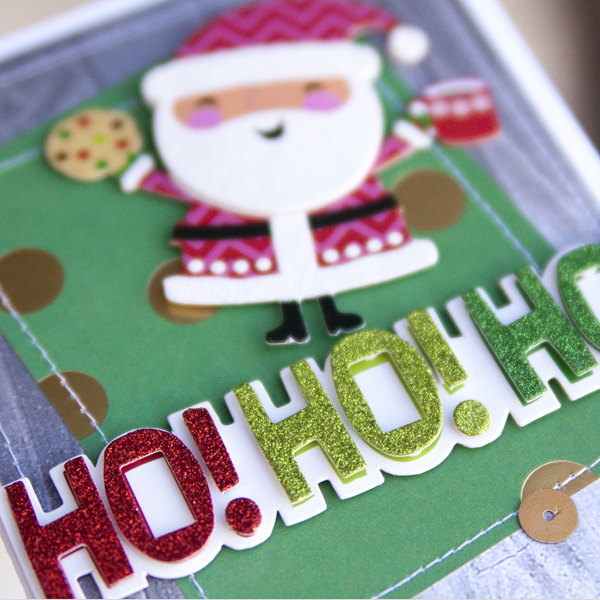 "I was so excited to create a few Christmas cards this year for friends and family. The me & my BIG ideas holiday products are so easy to work with and perfect for any holiday craft. All I needed was mambi supplies and a little imagination. I envisioned these to hold gift cards for the office staff at my son's school -- they're so cute and will show the staff how much we appreciate them!" Happy & Merry Christmas Eve! Happy Thanksgiving! 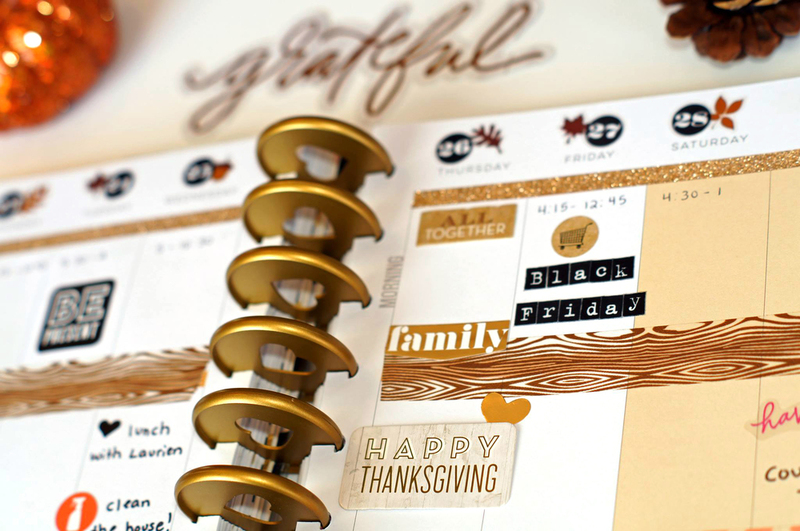 Today we're popping in to share an autumn-themed Thanksgiving week in The Happy Planner™ of mambi Design Team member Megan McKenna, and two Thanksgiving cards by mambi Design Team member Jennie McGarvey. "Thanksgiving is here! Time to eat lots of food, spend time with loved ones, and remember what we're most thankful for. In this week's spread I wanted to use warm colors with a touch of glitter. 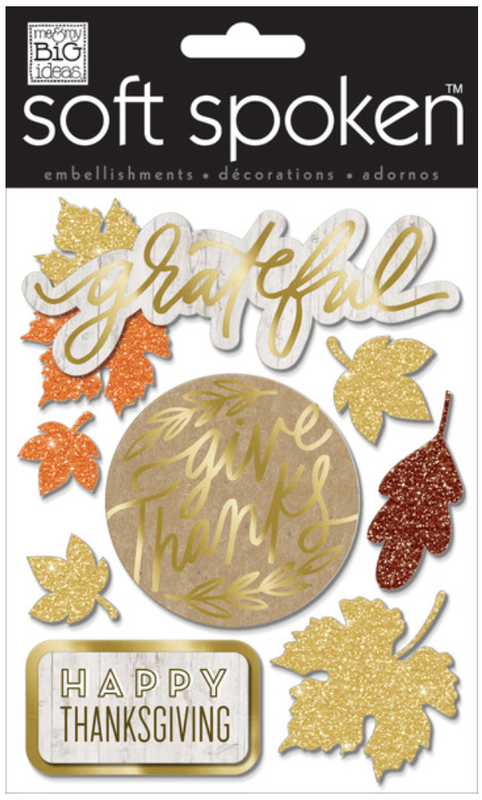 I added some leaves from the 'Give Thanks' SOFT SPOKEN™ sticker sheet and also some of the fun 'Fall Leaves' pebbles around the layout. I love the "Be Present" sticker that I added because it reminds us what is most important during the holidays." "Cards are awesome. They have so much versatility -- you can make them simple or you can spend more time for something a bit more elaborate. For my 'Happy Thanksgiving' card, I sat down with the intent to make something beautiful so I used lovely mambiSHEETS papers and 'Give Thanks' SOFT SPOKEN™ stickers. As a bonus, I added a few sequins from my stash. For my 'Give Thanks' card, it was fun to work with a smaller canvas. I started with a handful of supplies, the 'Friends' Scrapbook Kit and the beautiful SOFT SPOKEN™ stickers with some warm and thankful sentiments. I added a little texture with some machine stitching, trimmed off the edge of the circle sticker and then stuck it right on the card. I added a few leaves in the lower right hand corner. Super simple, nothing fancy but meaningful and quite autumnal." To say that we are grateful for all of you that read this blog and watch our Periscopes and get as excited about our products as we do is an immense understatement. From our family to yours, Happy Thanksgiving! This week the calendar officially transitioned us from Summer into Fall (here in the U.S.A.) and we've been seeing Autumn-themed layouts in your Happy Planners™ and craft projects. Today we've decided to share our own Fall-themed craft created by mambi Design Team member Heather Adams. 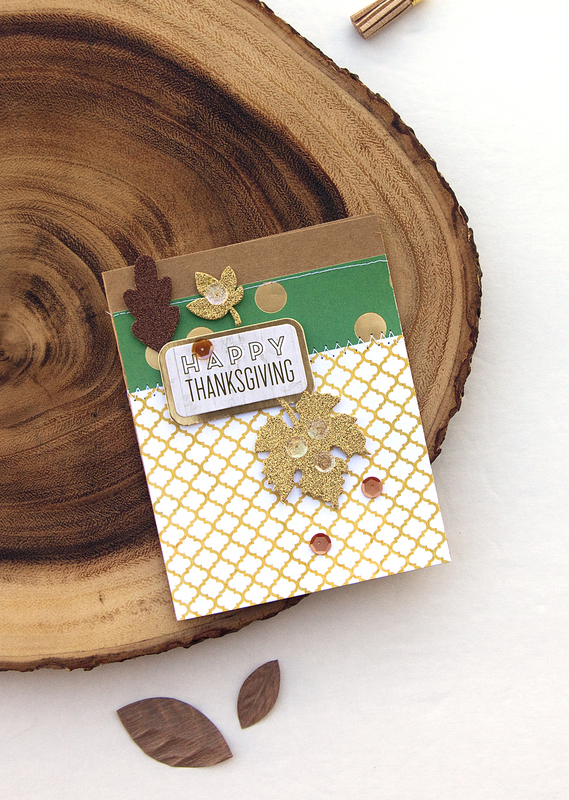 Heather created a see-through shaker pocket-turned sweet notecard using our popular Fall Leaves die cuts. "What's more fun than making a see-through card?! I decided to make a shaker pocket card front using my fuse tool and a plain page protector. All I did was place my confetti, die cut shapes, and sequins in between two plastic pieces (one page protector) and fused the edges together with my fuse tool. I then added my clear card to the card front (I left about 3/4" of paper attached to my card back to add my clear pocket from it). I think my friend will be happily surprised at getting this fun card in the mail (and I think it looks so cool with my note written on the inside of the card)!" Shop the supplies Heather used below by clicking on the product below. Summer Fridays are for POPSICLES, and today we're sharing these popsicle cards created by mambi Design Team member Heather Adams using one of our brand new 12x12 mambiSHEETS paper pads that features beautiful swirly-patterned paper. "Summertime is HERE and with that comes my love for popsicles! Not only are popsicles the perfect cool treat on a hot day, they're also adorable! I thought I'd use the marble-patterned paper in the one of the brand new mambiSHEETS pads (not yet listed in the shop] to create some smoothie-esque popsicle embellishments. I hand-cut each popsicle. I think the imperfect shape of each pop make it that much more cute and whimsical. I originally planned on including nine popsicles on my card, but ended up only using six. Since I had three popsicles left over, I went ahead and created an extra mini card. (Remember to use your leftover bits and pieces when you already have your supplies out.) I used a basic POCKET PAGES™ card and added the shapes right on! I think I will give this card to my sister someday soon. I love leaving her special little notes every now and then." Sometimes a simple shape made with the right patterned paper can make a big impact. We love how Heather paired the bold & graphic Happy Planner™ alpha stickers with the soft & pastel popsicle patterns. You have to love June for its promise of reprieve to all of the hard-working teachers out there. Today we're sharing two end of the year 'Thank You' cards created by mambi Design Team member April Orr as a crafty way to show her appreciation for all her son's teacher has done him this year. "The cards were fast and fun to throw together. To make them, I drew a light outline of a circle on each card to help guide where I was going to place the stickers. I wanted to ROYGBIV the color scheme and use as many stickers as I could. I love how they turned out! My son, Jake, signed them and will be sending them off to his teacher today." we wish you a safe and happy summer break!